This set of three interconnected commentaries begins by tracing the evolving narrative of the local food movement to embrace racial equity as a critical part of a sustainable food system in Michigan, using the Michigan Good Food Charter as a potential framework. Researchers, educators, and advocates of local food must first have a clear understanding of the structural racism that is present in the American food system before they can work effectively toward the vision of sustainable and equitable food for all. The commentary then calls out the need for new tools and resources for local food students and professionals (including Cooperative Extension staff) to better understand the role structural racism plays in the U.S. food system. 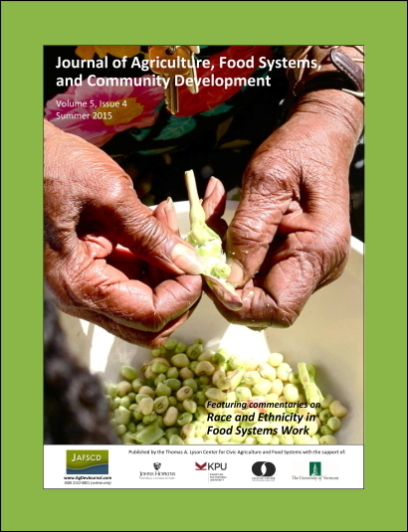 One new resource identified and developed by two of the commentary authors is an annotated bibliography of structural racism present in the U.S. food system. Senior Associate Director, Michigan State University (MSU) Center for Regional Food Systems; 480 Wilson Road, Room 302; East Lansing, Michigan 48842 USA; +1-517-353-0694. Graduate of the Department of Community Sustainability, Michigan State University.